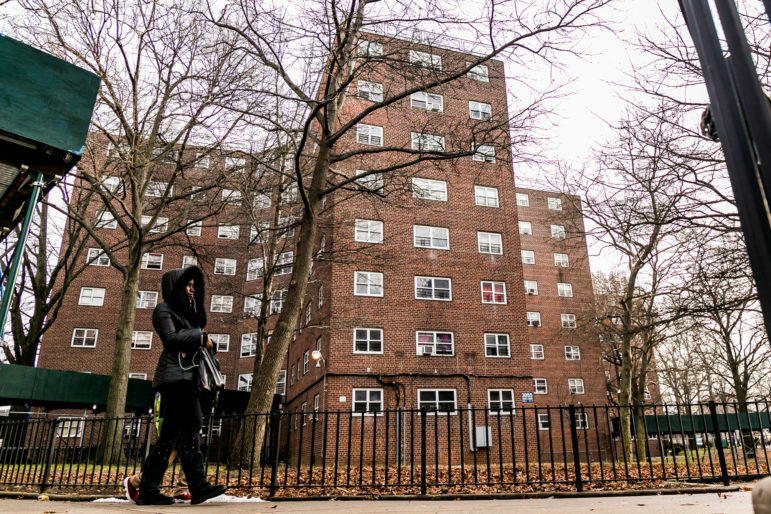 The state budget found new money for a lot of important causes—education aid, transit improvements, clean water—but not for public housing, despite the persistent crisis at New York’s housing authority. While the city would be on the hook to spend billions on NYCHA under a proposed federal settlement, the authority will need a lot more to address its $32 billion in capital needs. Maybe high-end coop and condo owners can help! Two Manhattan lawmakers, Assemblyman Robert Rodriguez and Sen. Brian Kavanagh, have proposed rescinding the condo/coop property tax abatement for the top 10 percent of owners and directing the $170 million in resulting revenue to NYCHA. Noting that the abatement is up for renewal in Albany this Spring, Rodriguez said at a press event outside East Harlem’s Taft Houses on Monday, “We think this is a really important opportunity to reevaluate what we’ve given to the top 10 percent of owners, who clearly don’t need it.” He was joined at the event by representations of the Citizens Housing Planning Council (CHPC), Community Service Society of New York, Community Voices Heard and New York Housing Conference. The abatement was launched in 1997 and, CHPC notes, has been growing in value in recent years even as the number of units receiving the abatement has dropped. The value of the abatement depends on assessed value. It’s a 28 percent property-tax break for properties valued at $50,000 or less, and 17.5 percent for properties assessed at $60,001 or more. Worth about $572 million in fiscal 2019, it’s the fourth largest tax break affecting city revenues, behind 421-a, the break NYCHA properties get and the Industrial and Commercial Incentive Program of Amazon-related fame. Some 300,000 properties received the break in 2019, with 76 percent of the dollar value flowing to Manhattan. CHPC says a threshold of $200,000 makes sure lower- and middle-class owners aren’t hurt. In terms of personal income—which probably overlaps a lot with property value—the top 10 percent of coop and condo owners make north of $350,000 a year. “The condo/coop tax abatement is just another vivid illustration of the City’s dysfunctional property tax system,” said Jamie McShane, a spokesman for the Real Estate Board of New York. Citing the newness of the proposal, NYCHA declined to comment. As with other taxes aimed at the wealthy, critics are likely to say establishing a ceiling for the coop/condo abatement could drive affluent citizens—and their taxes—away, and sap the market for high-end real estate. Two parts to this comment: First, you can’t pull on one thread of NYC’s real estate tax scheme without finding it’s inextricably linked to other stuff. Specific to this story, NYC’s residential co-ops and condos currently are assessed as though they were rental units. They’re distinctly different critters. Eliminating this link might, in a limited way, lead to more logical assessed values. And yes, then tax higher-valued units at a higher rate. Second, specific to finding funding sources (plural) for NYCHA, eliminate the current subsidy for car parking at NYCHA buildings. Charge market rates. Charging a higher rate for NYCHA apartments in highly prized locations in Manhattan would be a start. Then, selling off part of that land and building market rate apartments would be next. Interesting. Why would we charge low-income who happen to be in a Manhattan location more? That kind of goes against the whole idea of public housing, doesn’t it?